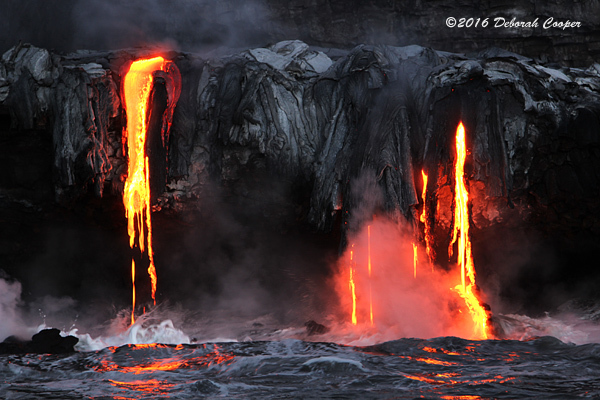 Home / Hawai'i / Show-N-Tell / Lava Shoot by Boat! 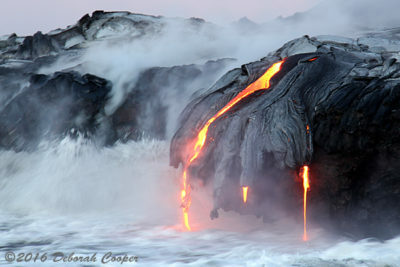 Lava forging new paths on its quest to join with the ocean waters. It is our turn to board our boat. Wait. It just occurred to me. We board the boat BEFORE it is in the water? This was a first for me! However, it was a necessity due to the nature of this particular boat “ramp”. We are all on and sitting safely in our seats. The boat trailer is backed carefully into the water and we are afloat! The boat is small but very stable and fast. 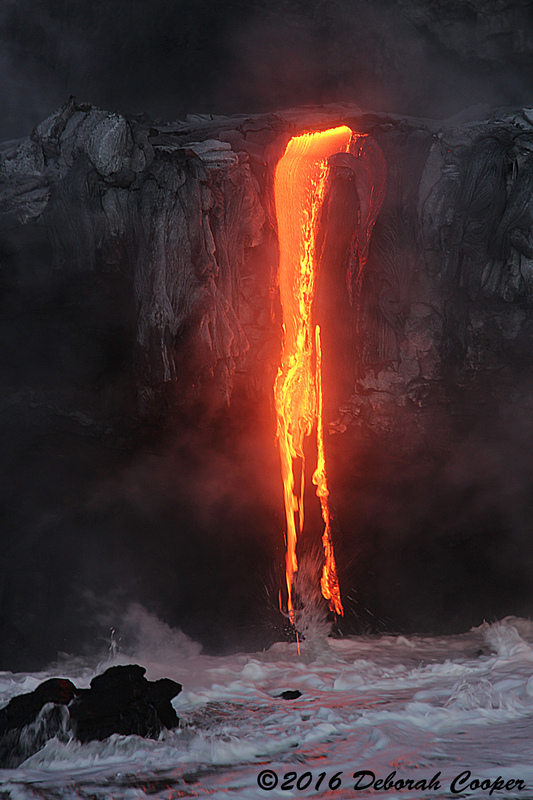 We are at the Lava Entry quickly. In the very dim of not-quite-dawn, the Lava flowing over the newly created land edge was a very bright Orange-Red; and the steam roiled into the air where water met with “fire”! 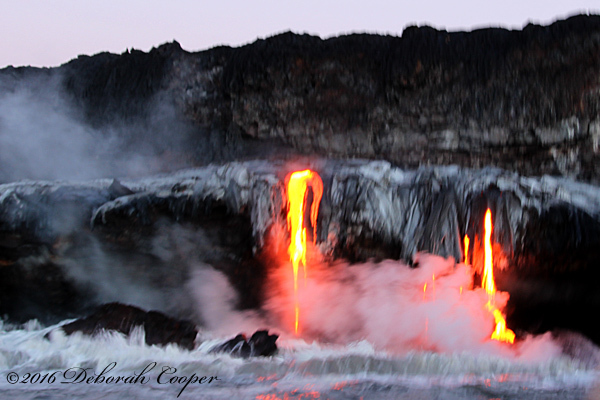 In the low light of morning, Lava falls pour over land’s edge into the Sea. The air was cool until we reached the area near the flow where we observed and took pictures. Then the light sweater wasn’t needed for a while. The water was even VERY warm to the touch. Little explosions were frequent as pockets of heat and gas hit the water leaving large chunks of lava floating, steam still billowing from them. The boats all took turns at the different view points. On occasion, we were nearly in the plume itself. It smelled strong of sulfur and felt like a sauna. When I looked closely at the water while under the plume, I could see glistening flecks that would disappear as the boat moved in the water. They were minuscule bits of glass from the Lava explosions. It was a GREAT Time! The boat and crew made even the “getting there and back again” enjoyable for me!  I want to do it again! Lava cascades into the ocean sending plumes of steam into the air.